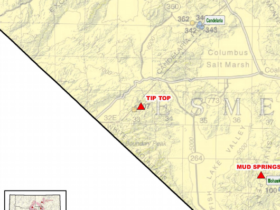 The TIP claims are located in the White Mountains (Buena Vista) mining district near the Mineral County line and approximately 6 miles south of Montgomery Pass, along US Highway 6. 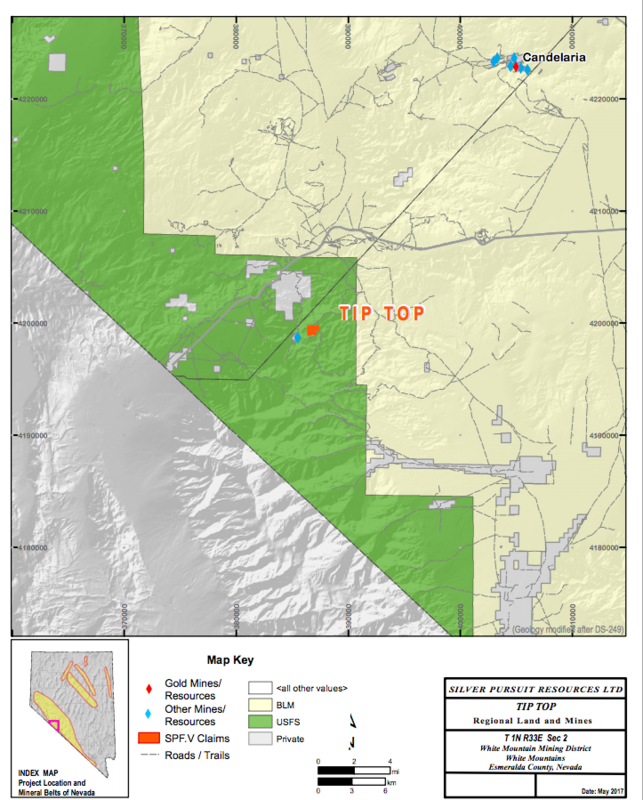 The nearest large towns are Bishop, 51 miles south, and Tonopah, 70 miles east. 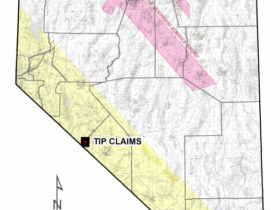 The TIP claims are situated approximately seven miles east of the California border. Elevations at the project range from approximately 6900 to 8300 feet (2100-2530m). The principal target, at the TIP claims, is high-grade, epithermal, gold-silver veining hosted in the Tertiary volcanic rocks. Potential for a bulk-mineable, volcanic-hosted gold deposit exists as well. Claims are situated along the projection of the ENE-trend that includes the Brownie and Tip Top vein systems. 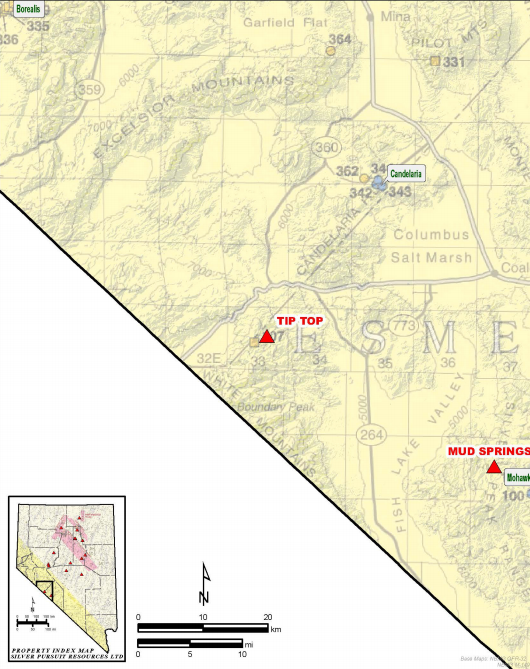 Additionally, the claims cover the intersection of the ENE-trend and the more northerly -trending silicified structure exposed at the Buckskin mine. In the Fish Lake Valley mining district, early production of mercury came from volcanic-hosted, epithermal veins; gold has been recognized in the vein systems as well. Gold production from 1915-1918 totals 6500 ounces. Minor gold production has also been reported from a small dredging operation in the vicinity known as the Tule Canyon Placers. 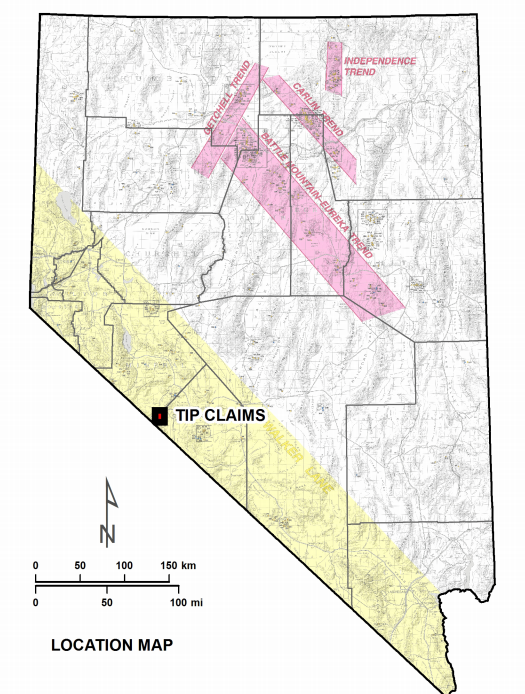 Since 1980, five drilling programs have been conducted in the area, southwest along trend from the TIP claims. 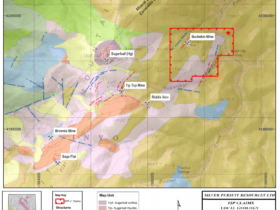 A comprehensive technical report (Barnard, 2013; non-43-101 compliant) was prepared for Parker Mining Corporation and provides details of past exploration including drilling of a total of 138 holes. These include 26 DDHs and 69 air-track holes along with rotary and reverse-circulation drilling. 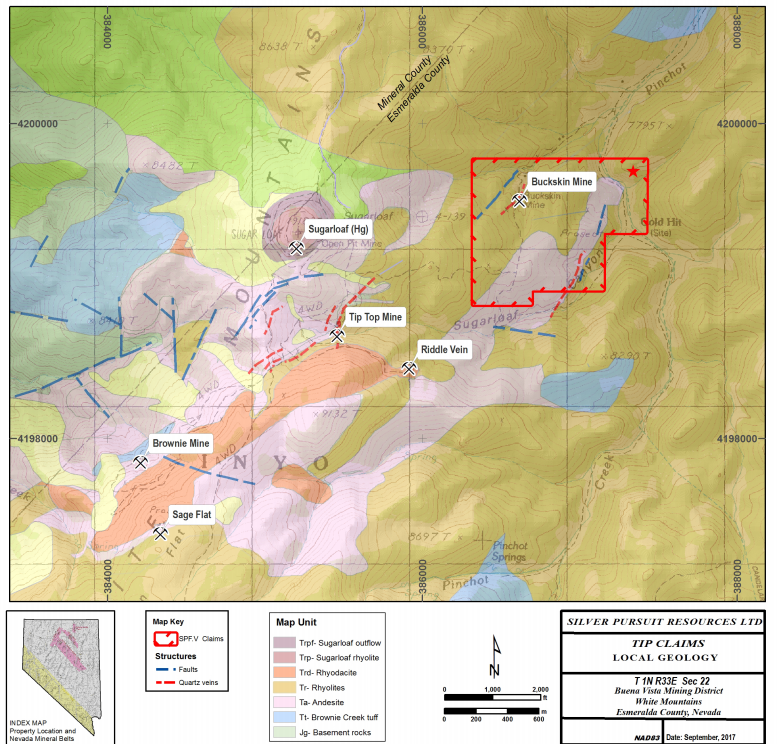 Assay results from sampling and drilling were used as the basis to calculate a 43-101 compliant, Inferred and Indicated Mineral Resource of 60,609 oz of gold and 359,379 oz of silver by N. Preuss (2009) for Gold Summit Corporation. Preuss concludes that the ENE-striking, Tip Top vein has a 400-m strike-length but that two other “untested, mineralized structures” are present over a 6 km strike-length. 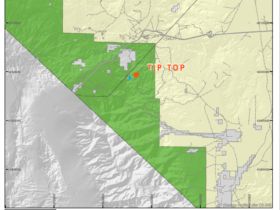 The TIP claims are located easterly from the Tip Top vein, along this untested, ENE-trending mineralized zone. The general geology is covered by the quadrangle-scale mapping by the USGS. More detailed mapping and interpretation is presented in the 2013 technical report (Bernard); his work is summarized here. The Tertiary map units include 1) rhyodacitic flow-domes, 2) basalt and andesite flows, 3) felsic tuffs and volcanic sediments and 4) flow-banded rhyolite (with associated perlitic domes, tuffs and volcaniclastics). Veins are hosted by rhyolite, andesite, and rhyodacite. Pre-Tertiary, basement rocks that include a Jurassic granite present, two miles west of the TIP claims. Preuss (2009) describes details of the structural setting at the Parker property and relates development of economically important northeast-trending faults to the large-scale regional features of the Walker Lane structural province. Movement along shear zones have developed dilational zones in the volcanic rocks that later, provided fluid pathways for the mineralizing hydrothermal solutions. Preuss notes that the continuity of the structures, beyond those mined, is evident by the interpretation of geophysical surveys on the Parker holdings. Nevada Bureau of Mines geologists observe that better zones of mineralized breccia occur at intersections with cross-structures. 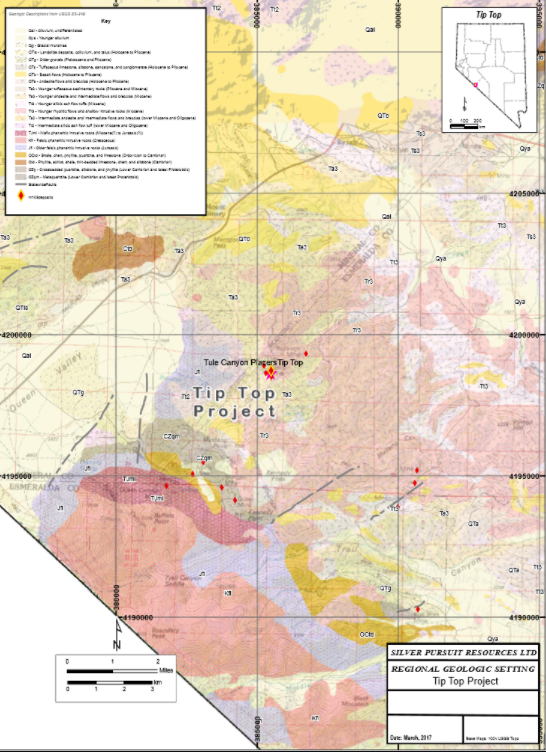 At the Buckskin mine, within the TIP claims, a pipe-like body of hydrothermal breccia is developed at the intersection of the N30E and a “shear” at N75 E. The style of alteration is epithermal; multiple banded-silica phases coating breccia fragments occur in the mineralized zones. The gold is reportedly free milling but very fine-grained (1940 property report). Bernard (2013) describes the Tip Top vein system as follows:” The Tip Top adit was exploited along two discrete veins – one in the hanging wall the other in the footwall – along 360 feet of strike…. The footwall vein has an average width of 6 feet and is hosted in andesite, while the hanging wall vein is narrower, about 3 feet average width and sits at the andesite-rhyolite contact. These veins appear to come together creating a zone up to 15 feet wide. The strike length of the vein in this area is over 1,000 feet. 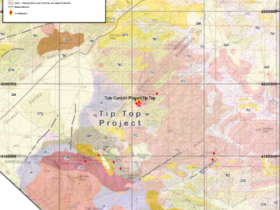 The Tip Top Mine mineralized vein has an identified strike-length as far as 1,200 feet to the NNE from the adit portal (Casteel, 2004).” He also calls attention to a parallel vein at the Riddle prospect, 1200 feet SE of the Tip Top vein. The Riddle Vein, where sampled in a roadcut, averaged “0.15 opt over a vein width of about 10 feet”. Geologic mapping is planned to determine the extent of important vein structures at the TIP claims. Systematic sampling is to be carried out to characterize the distribution of trace and precious metals at the project. Geophysical surveys may be conducted to gain understanding of the subsurface geology and determine favorable subsurface target zones to be drill-tested in the future.